It has been said that you are what you surround yourself with. Growing up in Pune, Yash Walvekar watched his father run a business dealing in speakers- Samarth Quality Sound. Right off the bat, the world of sound and audio fascinated him and he pushed his father to let him be involved in it. But like most offsprings, he was kept at bay, and was asked to focus on his studies. It was around this time that Yash began following his other passion – trekking and mountaineering. Being a person who loved the outdoors, he enjoyed going off on hikes and soon this passion grew to include rock climbing and indoor wall climbing. After he completed his tenth grade, he joined Pugmarks, an adventure and wildlife travel company, working as a volunteer guide to take children and students on hikes, treks and nature camps. Having led multiple trips, and ensuring that every aspect, especially safety was taken care of, he was looking for something to challenge his skills and interest a little more. He got that with the Basic Mountaineering Course at ABVIMAS (Atal Bihari Vajpayee Institute of Mountaineering and Allied Sports). The 26 day training program which imparts skills in various climbing and safety techniques in rock, snow and ice, height gain, survival techniques, knots and theory had Yash certified as a basic mountaineer for expeditions. By this time, Yash had also completed his BBA and went back to his father, asking him to let him join the speaker business. The question he was faced with then was his lack of knowledge and skill in the audio industry, which he decided to remedy by joining Audio Academy. He was keen to know what the needs of companies and live acts were in terms of audio and be completely prepared to cater to those needs. 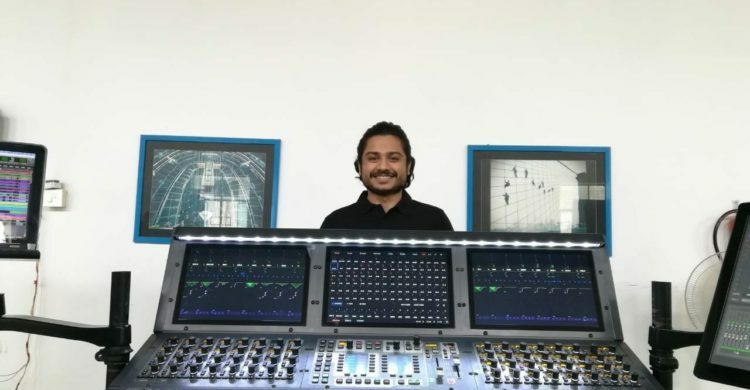 Yash joined the Diploma course in Live Sound and the system design module particularly caught his interest. As part of the course, he was given a month to make his own speakers. He began with the basics – by referring to those who had already done it brilliantly. Looking over the parameters of the speakers by Meyer Sound as well as d&b audiotechnik, he calculated the parameters he needed for the speakers that he was planning to build and planned out the box design. He knew that he needed 14 litres of volume. Once he had the parameters and design sorted, he approached a carpenter, giving him the design and had him make it. Once the final product was ready, he submitted the spec sheets and went on to being an Audio Academy Certified Systems Engineer. Now, all set to begin working in his father’s company, Yash has a beautiful vision for where he wants to take the company. The business as it stands right now only manufactures core speakers and not boxes. He wants to expand the business to include box speakers and also get into the installation and systems design business. And he is all set to do that back in Pune.